Yep, you can have your clean eating gravy recipe and eat it too. Here’s how! I admit it. Gravy is my favorite part of Thanksgiving dinner. Dressing comes in a close second. Do you feel the same? I realize that for many people, gravy on any dinner is avoided like the plague. But I’m here to show you that it doesn’t have to be! I’ve said it before and I’ll say it again. I strongly believe that 80-95% of your favorite recipes can be converted to clean and healthy eating. Here’s one more recipe that proves this belief. Want gravy without all the fat? Give this recipe a try! In a large pot, combine the flour, cornstarch and stock/broth using a whisk. Add all other ingredients (spices), and whisk well to combine. Turn on the heat and bring the gravy to a boil, whisking often. Once the gravy boils, reduce the heat just enough to keep it at a low boil. Not a simmer. Boil the liquid down until it's about half gone. (This can take about 20-30 minutes or more). Whisk frequently. Adjust spices to taste. 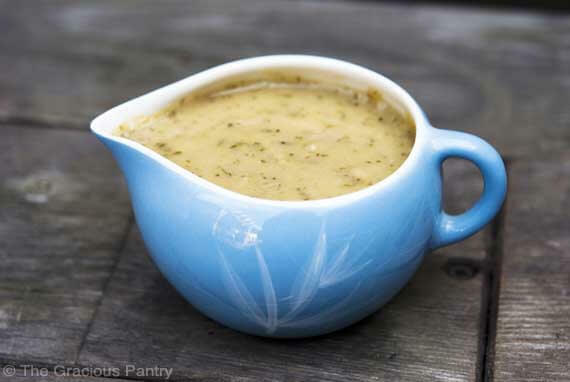 I didn’t grow up with gravy on the Thanksgiving table, but this is a recipe worth trying! My favorite part of Thanksgiving dinner is a three-way tie between cranberry sauce, mashed sweet potatoes, and all of the desserts :). Oh, and the enormous “gobbler” sandwich that I always make the next day out of leftovers! Question: Can I use regular Whole Wheat Flour or does it have to be the pastry flour? Joy – You can use regular, but it will have more of a “coarse” texture to it. Not as smooth. 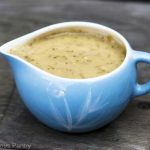 I was just talking to my son about gravy last night – he doesn’t think I can have it but with this recipe I’ll show him a better option! Thanks! 🙂 Can this be made a day ahead and then reheated? As for my favorite part of Thanksgiving dinner, it used to be dessert but I’m thinking this year it will be the turkey! Christine – Yes, it can be done a day ahead and rewarmed. Enjoy your Thanksgiving! I consider “clean eating” to be dishes made without wheat flour since we now know that wheat crops are drenched in Roundup. Carol – That would be a personal choice to make for yourself and your family. Organic wheat is not drenched in Roundup, at least not as far as I know. But any whole grain is considered clean by definition. Taking that a step further by buying organics is, of course, the better choice, but not always an option for people. Do you use ground versions of all the herbs and such or fresh? Briana – Unless I mention “fresh”, they are all dried. That applies to all my recipes. Can i use wholemeal flour ? Jasmine – Yes, but it will be more “gritty”. What’s the serving size for this? Kelly – It’s a 1/4 cup.